It is your responsibility to make your religious tradition . . . more truly religious by the time you are through with it. That’s the great challenge we face. God, it seems, has left interpretive gaps in the universe itself, and therefore also in the Torah. The world and the text await interpretation. In observing reactions to the Ordain Women movement, an argument I have seen again and again—even from some folks who are open to female ordination—is that such a change can come only from the top down, from God directing church leaders. As such, it is improper for church members to agitate for change. I believe this view is inconsistent with patterns of creation we see in scripture and with the Mormon understanding of eternal growth and progression. Just as our Heavenly Parents did not create the universe ex nihilo, without any pre-existing materials, neither have They yet completed the process of creation. This would be antithetical to their purpose for creating the earth, which is pedagogical. The world is a tool for helping us become more like our Heavenly Parents. They invite us to join in its creation so we, too, can learn to be creators. God asked Adam to complete the creation of animals by naming them. God required Eve to make a choice that determined the very direction of the earth’s history. In the present moment, the work of creation continues: birds build nests, gophers tunnel, and humans erect skyscrapers and plant trees and perform acts of kindness and write poems and make love and produce babies who then continue the process. Creation will not be over until the end of time. The restoration of the gospel fits into this pattern of creation. 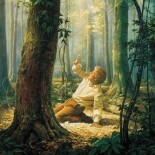 Our Heavenly Parents started the ball rolling and gave direction, but They left much of the work and decision making to Their friends, Joseph Smith and the Saints. Because our Heavenly Parents have made us partners in creation—because They leave some details for us to work out—there is considerable opportunity for hurtful traditions to develop. We have seen this in the withholding of the priesthood from Saints of African descent. Like any good teacher, our Heavenly Parents do not immediately correct our mistakes. Rather, they allow us to see the consequences of those mistakes and learn from them. Why is this mistake-correcting not the sole province of church leaders? Why has the thinking about church structure and policy not been done when our leaders speak? Because the church, like the world, is a pedagogical tool for everyone to learn to create, not just church leaders. We must all think. We must all listen to the Spirit. We must all search the scriptures. We must all determine the direction of the church. The church is a partnership between leaders and members, not a command chain. As members, we must claim the role of creators-in-training that we have so long improperly ceded to church leaders. We have not only the power but the responsibility to continue transforming our imperfect church into Zion. So is female ordination the best direction for the church to go in? I can only say that it feels utterly right to me when I pray and read the scriptures. It feels like the work of God in the world. Others feel differently. When we come together as church members and leaders to work this out, we will be acting as true co-creators with God and heirs of the kingdom. You know, I really like the way you think. I love that you point out that “the church, like the world, is a pedagogical tool for everyone to learn to create, not just church leaders. We must all think. We must all listen to the Spirit. We must all search the scriptures.” I entirely agree. This world is really a gigantic classroom. However, I’m not sure I agree with your concluding sentence to that paragraph, “We must all determine the direction of the church.” That’s where everything breaks down for me. In a classroom, it’s not the students but the teacher who determines the direction of the class. Similarly, Deity determines the direction of the church. Often in classrooms, a teacher will select one student to lead the others in an activity. The purpose is not to elevate that student above the others, but to give all the students an opportunity to learn. Both the leader and the followers learn important lessons. As the leader obeys the instructions of the teacher, the students should also obey the leader. The leader can be reprimanded when necessary, but, as you said, a good teacher will let the leader struggle to do their job, because they learn more that way. Also, the other students can learn how to support a leader rather than tear down, nit-pick, and otherwise abuse the privilege of having a guide. Personally, I don’t have an opinion on whether or not priesthood ordination will someday be available to women (well, I do, but it’s a lot of speculation that I don’t want to go into in this comment), but we need to learn to be good followers and support our leaders. That doesn’t mean to blindly follow them, but to support them in love and through our faith in Christ. We can express our opinions in good faith, but we need to make sure that the way we express those opinions does not undermine the responsibilities that were placed upon those leaders by Christ. A campaign for change is a perfectly good institution for a democracy, but a classroom is not a democracy, because there are important objectives that the teacher needs to accomplish. Similarly, the church is not a democracy because there are important objectives that our Father needs to accomplish. So a campaign for change might not be the best way to express our opinions in the church. Thanks for your very thoughtful reply! It seems like you and I have very different views of the learning process. You say, “[W]e need to learn to be good followers and support our leaders.” My response is that Mormons have already learned this lesson, perhaps far, far too well. One does not learn to become a creator, much less a god, by only following. There must also be some true participation in the creating of one’s church and world. You say, “[T]he church is not a democracy because there are important objectives that our Father needs to accomplish.” I am suggesting that our Heavenly Parents’ #1 objective is to develop our talents and capabilities so we can also create worlds. How can they do that with a group of people who look on while their leaders make all the decisions? Of course there is a place for leaders in the kingdom. But the interaction should be a horizontal discussion rather than vertical mandates, in my opinion. Edward, I continue to be pleasantly surprised by your artful expressions of so many of my thoughts on religion. Given our political differences, who would have guessed I would agree with so much of your religious philosophy? I’m very glad you’re sharing yourself. You are enriching my world. Fantastic observations Edward. I’m so glad we’ve become internet acquaintances! I’ve had quite a few conversations on exactly this concept of late and I feel like it’s an extremely valid position. I can also hear what “Who Me?” is saying to some extent, so allow me to position myself between you for an observation as well. While I complete agree that we are part of the forward movement of the church as individuals, I also believe in the organized practicality of the hierarchy, more or less. I agree that it’s not ideal for the simple fact that imperfect humans impact the process negatively as well as positively. Ultimately it is Deity that directs the church, but with the caveat that OUR faith determines the extent of that direction. So my position between the two of you is that I strongly believe that the level of faith within the hearts of the members has a stronger bearing on the direction of the church than the intentions or faith of our leaders, but that there is an important truth principle that should regulate the conversations regarding that direction. Simply being right is not enough. We who seek to improve the practices of the church have the responsibility to converse with others from a place of love. We have the responsibility to bear the spirit of God with us so that our opinions don’t offend or come across as being off base. When our words are accompanied by the spirit of truth, the spirit of truth will work on the hearts and minds of the hearer far more effectively than our correct words. To harbor any other spirit when seeking a higher way is more like satan’s plan. It defies agency and embraces force. It relies on strength of volume, not on faith in truth. I’m glad these conversation regarding church policy are taking place. I’m not glad they’re taking place without the guidance and witness of the spirit more often. In closing, let’s prepare our hearts and minds to foster higher truths by embracing the principles of the spirit of truth and love. And let’s share that spirit with others in such a way that the spirit can lift us all together and not divide us. And then we can all rejoice in the greater light and knowledge God certainly has in store for us in this dispensation of the fullness of times. A biographer of Eliza R. Snow presented our stake’s quarterly fireside. She said Relief Society ceased to function after Joseph Smith’s martyrdom and, of course, its president, Emma Smith, didn’t come west. Eliza married Brigham Young and sat at his right hand every night at family dinner in the Lion House. Brigham didn’t share Joseph’s vision for women and didn’t see the need for their own organization. Eliza didn’t let the subject die even though it took TWENTY YEARS before Brigham made her the second president! Eliza’s personal drive most certainly had a part in what is now considered the work of God. It is my belief that creation is eternal and therefore will never be over. I like that, Melissa! Have you ever heard of process theology, by chance? My understanding is that process theologians believe in continual creation. Edward, I love this post. Honestly, the view of our church as an entity evolving towards perfection is the only one that really makes sense. Also, it gives me a lot of hope for a more inclusive future. (Also, we met at the OW event. I love your blog). This entry was posted on October 4, 2013 by EdwardJ.